Have you ever heard of Prix Caprilli? I never had… until my instructor announced that was what we were going to do in my last riding lesson. It turns out that Prix Caprilli is basically dressage – but with jumps! I know, ingenious right?! Why then has practically no one even heard of it, let alone competed in it? After my lesson I did a bit of research. Prix Caprilli is named after the Italian cavalry instructor Federico Caprilli, who invented the modern forward seat used when jumping. This now almost unheard of discipline was very popular during the 1960s and 70s, when many riding clubs competed in it. With the rise of modern dressage Prix Caprilli fell out of popularity, but is now making a comeback! If you ask me, it was due a comeback years ago!! Prix Caprilli is great fun and also helps improve your riding skills! In many ways it’s a lot like a dressage test. You’re judged on balance, impulsion, accuracy, position – all the things you’d usually expect in dressage! 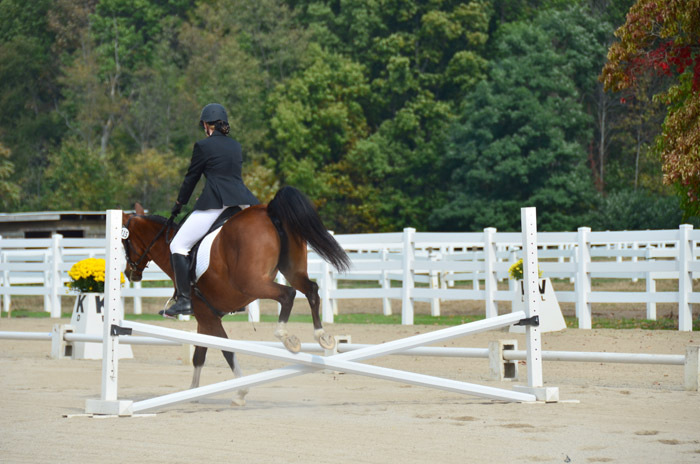 The idea is that horse and rider should be so in harmony that the jumps shouldn’t affect their way of going. Prix Caprilli is an interdisciplinary challenge, requiring lots of concentration! The main emphasis is on dressage. Prix Caprilli tests include walk, trot, canter, and circles. The only thing they don’t have is the more advanced dressage movements. Instead there are jumps!! Typically there are about two, both quite small. If you’re practising at home you can replace them with poles on the ground to start with. Just one of the reasons Prix Caprilli is so great is that it encourages both horse and rider to think forwards. It also focuses on accuracy rather than the height of the jumps, boosting confidence as well as improving your riding. Prix Caprilli may be considered a bit old-fashioned, but it really is the best way to combine different aspects of your training. To borrow a cliché, Prix Caprilli has the best of both worlds! ← My First Blog Post!! !